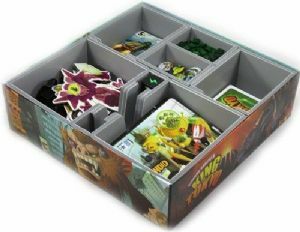 This insert is designed to be compatible with King of Tokyo. The trays have space for the original game and the Power Up! and Halloween expansions. The design provides both efficient storage and improved game play. Many of the trays can be utilised during the game, and they greatly aid set-up and clear-away times. The board and rules act as a lid on top of the trays. There are two vertical slots in between the monster trays for storage of extra dice, as shown in the picture.